When I was four, doctors removed my dad’s left eye because of a rare disease. I remember, and my mom remembers, my relentless questioning: What will happen to the eye? What does the world look like with one eye? Is it like when you close one eye? Does half of what’s in front of you disappear? Will the other eye be okay? Will the other eye have to work harder? Will it get tired? “Columbo has a glass eye,” my mom told me. And that shushed me — because if Columbo, a disheveled, chain-smoking, blue-collar L.A. homicide cop, could solve crimes with one eye, my dad would be okay. In case I needed to outsmart a criminal someday, I taped Columbo episodes and watched them compulsively, studying his investigative techniques. Looking back, I find it somewhat odd that my overprotective dad allowed me to watch Columbo — although, for a show about solving murders, there is very little violence. Each episode is mostly dialogue and follows the same structure: First, the murderer commits what he or she believes is the perfect crime; next, Columbo finds and follows clues while the murderer attempts to deceive him; and finally, Columbo catches the murderer. The audience already knows who committed the murder and how it happened. The suspense derives from watching Columbo’s investigation. The show provides an excellent lesson in how to advance plot through character. “Don’t sit so close to the TV,” is something I often heard while watching Columbo’s eyes. The right one rarely moved. My mom confirmed that it was fake. When asked, the actor, Peter Falk, talked about it in interviews, but my mom didn’t know if the glass eye figured into Columbo’s storylines. Still, I remained impressed — because if Peter Falk could act with one eye, then my dad would definitely be okay. Eventually, I forgot about the glass eye and whether Columbo wore one or not. He shared other qualities with my dad. This included cops. They unnerved my dad. Whenever one pulled us over, which happened a lot (my dad drove dangerously slow, especially for someone who’d been a New York City cab driver), my dad’s hands would shake. He’d want to step outside the car before the cop even approached. “Don’t do that,” my mom would say, “or he might shoot you,” which didn’t exactly calm me or my dad. But Columbo seemed like a trustworthy, decent cop — maybe because he busted snobby, rich people. I did, however, suspect him of telling white lies to criminals. For example, he mentioned his wife a lot, but the audience never saw her. I figured he made her up, a means of making relaxed conversation with murder suspects. He was always complimenting me. The viewer never learns much of Columbo’s backstory. His office is rarely shown. His house is never shown. Columbo is mythic; he comes from nowhere. And my dad also seemed to come from nowhere. He rarely talked about his 50-plus years in New York. He made me feel as if his life began with mine. In the months after his surgery, when he and my mom picked me up from kindergarten, he’d wait in our rusted reddish-brown van. I didn’t understand why. “It’s the eye patch,” my mom explained. In his late 60s, he knew the kids already teased me about his age. But I didn’t see why that mattered. I also didn’t see why the eye patch mattered. But they hadn’t heard of Columbo. “It’s better than any cartoon,” I told them. As the child of older parents, my pop culture references rarely made sense to other children. The first time I saw Beauty and the Beast in theaters, I excitedly shouted “Murder She Wrote!” after hearing Mrs. Potts speak. In kindergarten, I often imagined stories about Columbo and Murder She Wrote’s Jessica Fletcher falling in love and solving crimes together. Each of my stories started the same way: somebody evil and rich murdered somebody nice. Usually, the rich person lived in a house with a finished basement, a fireplace, a satellite dish, and freshly cut flowers — proof, I thought, of tremendous wealth. I shared one of these stories with my teacher, and she made me stand against the wall to think about what I’d done. I’d named the murderer Abraham, an allusion to the Old Testament’s Abraham, and this time he did murder his son. She must have considered my modern revision of an Old Testament story blasphemous. I’m only guessing. She never explained. I recently returned to Columbo, curious about whether it’d hold up. My partner Chris and I played the first episode. Midway through, he was checking his phone. I continued watching, but Chris was back to his phone, reading NBA trade rumors. I laughed so hard I almost cried. Chris smiled, humoring me. Glass eyes aside, I recognized my dad in Peter Falk. Peter Falk sat the same way, smiled the same way, and told great stories. Neither man seemed to care what people thought of them. Unlike Peter Falk, my dad didn’t star in a popular TV show. He’d been a barber, a foreman at a pocketbook factory, a cab driver, and a hospital maintenance painter. His obituary was short. His photo grainy. Peter Falk died in 2011, nine years after my dad died — and I still hadn’t finished the book I'd promised. Peter Falk’s obituaries mentioned his glass eye. I remember thinking, Why does the eye matter? And yet his eye was why I first fell in love with Columbo. The book I wrote for my dad is called The Glass Eye, but it’s not about his eye. It’s about my love for him. It’s about how great he was. So why does the eye matter? It didn’t cause his death. But it was the first clue in an investigation of my grief. 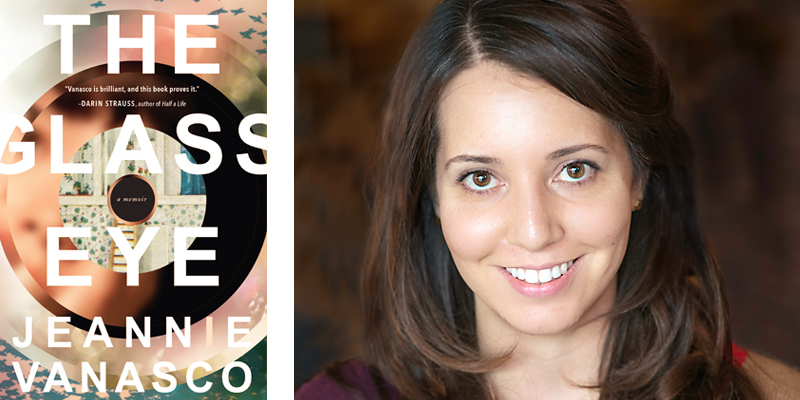 Jeannie Vanasco has written for the Believer, Little Star Journal, NewYorker.com, Times Literary Supplement, Tin House, and elsewhere. Born and raised in Sandusky, Ohio, she now lives in Baltimore and teaches at Towson University. The Glass Eye is her first book. One Response to "Columbo’s Eye: An Investigation of Grief"
Did you know that Peter Falk was also an artist? You can see one of his drawings in Nathan Goldstein's book, Design and Composition. I always loved Columbo too.